It’s a joy to get to curate this poet’s sampler and to feature the work of two poets I deeply admire. They are, I think, two poets we haven’t heard enough about yet and I hope this will whet your palette and send you to their work in other venues, and to their books, which are coming out soon. In my life as a reader and person living in the world I always want to be surprised not so much by that which is entirely new (though I love that) but, more, by the revelation that something I’ve seen before is now being shown to me in an entirely new light. I am in love with being wrong with knowing I haven’t even scratched the surface of a thing. Maybe it’s because my eyes and my balance always bring me to new understanding of what the world has to offer (its gifts and dangers). I want that in the poems I read: the sense that they welcome me and are ready to show me all I don’t know. Margaret Ronda and Maya Phillips are poets who each, in their own way, insist upon me being rigorously open to the possibilities of the poem. In this sampler we have poems that tread familiar ground but in a way that feels really new to me. Whether it is the death of a father or a mother trying to get work done and her child wishing her “Good luck!”, life, and the afterlife, in the hands of these poets is complicated, troubling, and also full of the joy of discovery. We meet these poets at opposite ends of extremity: the birth and raising of young children and the death of a mysterious father. I first read these poems of Maya’s when I was her teacher (and her student) in the MFA Program for Writers at Warren Wilson College. I was pretty blown away by the way she brought us into the afterlife of the father as a means of bringing us to understanding the complexities of being his daughter in the living world. I’m so excited to read these poems in the book that’s forthcoming from Four Way next year. And Margaret Ronda. Here’s a poet and scholar whose work I have loved for years, since we met through visionary poet Brian Teare. Her new book, For Hunger, sees her at the height of her powers as a poet. To me, the long poem “Apple Cake” that’s included in this grouping is an excellent introduction to the way she tells the harder truths of parenting: the loss of self that comes alongside the amplification of love we read so much about. Yes. These are poems and poets I’m so grateful to be reading and rereading. I hope you’ll keep going and read their books. There’s endless pleasure and trouble here. Gabrielle Calvocoressi is the author of The Last Time I Saw Amelia Earhart, Apocalyptic Swing (a finalist for the LA Times Book Prize) and Rocket Fantastic. 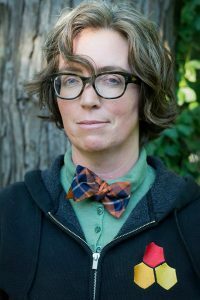 She is the recipient of numerous awards and fellowships including a Stegner Fellowship and Jones Lectureship from Stanford University and a Rona Jaffe Woman Writer’s Award, among others. She is an Editor at Large at Los Angeles Review of Books, and co-curates the digital maker’s space Voluble. She is a queer lesbian living in North Carolina who teaches at the University of North Carolina at Chapel Hill.